After further, in-depth study of the resources available, I have come to the conclusion that the proposed 13th amendment was NOT ratified. Rather than go into a long explanation of this decision, I will point you to a detailed paper written on this subject. 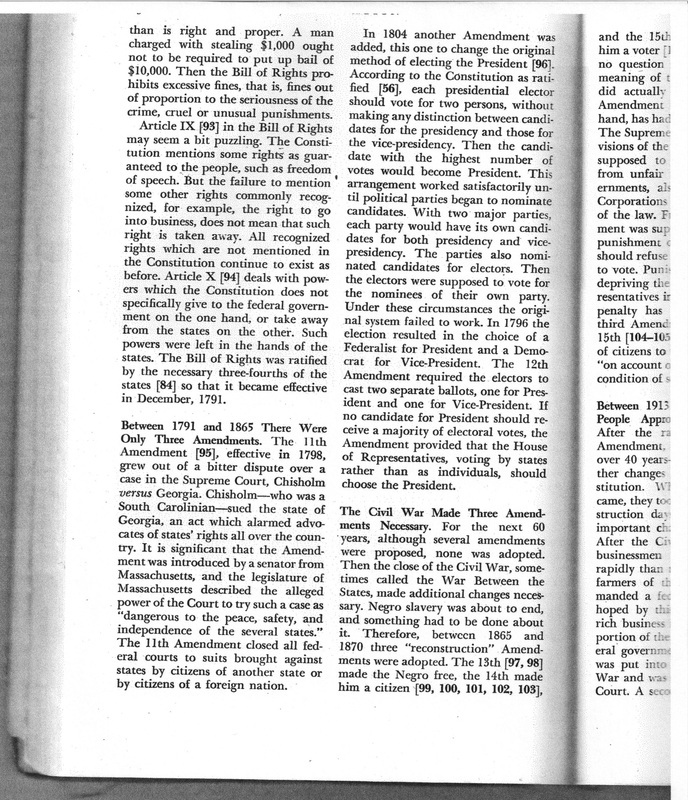 Because of the importance at the time for such an amendment, I will leave the article I wrote below for purposes of study and as an example of how easy it is to be deceived by an error that is copied and propagated over time and new meanings attached which appeal to those who long for a return to constitutional governance. Those of us who long for that must be careful we do not buy into ideas and errors that appeal to us. We must search out the FACTS and the TRUTH. The inclusion of the original proposed 13th amendment in books was a result of the confusion even in Congress as to its status. Some printers and even government printers included it "to be safe" since it looked like it would be ratified soon. However, failure of the Virginia Senate to pass the bill, meant the amendment was not ratified. The printing of the amendment in Virginia's Laws d﻿oes not ﻿constitute ratification even by Virginia's standards. Seeing as truth is very important to me and this church, as much as it pains me to do so, I must proclaim that the following is a result of the propagating of those errors. I will leave it for some time, but will eventually remove it. Most of us either have been affected or know someone who has been affected by the sad reality that the "have nots" suffer more at the hands of the justice system than the "haves". Our courts and the attorneys that play the court games have been taking advantage of people for so long that it is a sad truth that many people have given up on the idea that they will ever experience fair treatment in our justice system. Looking in the Phoenix Yellow Pages, I noticed that Churches and Schools take up about 16 pages each, while Insurance (insurance companies employ a lot of lawyers) takes up 44 pages. So much for our national motto, "In God We Trust"! But that's another issue. Restaurants and Auto related pages take up 54 and 65 pages, respectively. Can you guess what business takes up the most pages? I'm sure you can - Attorneys. They take up a whopping 79 pages! That is more than any other business in the phone book! America has become way too litigious. While lawsuit-happy people get the attention of the public due to outlandish awards on occasion, the real bulk of the use of lawyers is for the defense and prosecution of criminal and civil cases, with civil cases, such as traffic citations, outnumbering the criminal cases by far. Have you ever had to pay a lawyer's bill? Do you know that they charge anywhere from $150 - $1000 an hour and more? Notice the second definition states, "Esquires by virtue of their office, as justices of the peace, and others who bear any office of trust under the crown." Is it not reasonable to think that those "under the crown" would bear loyalty to the crown? Bouvier's Law Dictionary was the first law dictionary printed in the United States with American definitions included, not just English definitions that derived from Breat Britain. As you can see by the first definition, the title was applied "to officers of almost every description... and others", as well as to "members of the bar. The American definition also points out that "No one is entitled to it by law, and, therefore, it confers no distinction in law." This allowed lawyers to have the title "Esquire" as a courtesy, or sign of respect, but not conferred by the British monarch. But at the same time there were lawyers who were members of the bar, who had been given the title "Esquire" by the British monarch and, therefore, would have loyalties to the Crown (king of England). Even men like Benjamin Franklin, John Adams and John Jay used the title of Esquire after their names, as noted in the paragraph preceding Article I of the Treaty of Paris. Since America had declared its independence from the British monarchy, our forefathers wisely foresaw this as a potential problem. There was a need to separate the lawyers loyal to the Crown from the lawyers who merely wanted to help adjudicate justice in America for Americans. This was accomplished fairly early in the history of our country with the introduction and ratification of the original 13th Amendment. But you wouldn't know that today because of a devilish fraud that has been committed against We the People right under our noses. If you would look up the 13th amendment to the U.S. Constitution in any current publication you would find that it deals with the abolition of involuntary servitude. But that's not what the original 13th amendment dealt with. Below is a comparison of the the original 13th amendment, as it appears in hundreds of books and publications around the country, and the 13th amendment as it appears in virtually all of the Constitutions that have been printed in the last 120 years. If any citizen of the United States shall accept, claim, receive, or retain any title of nobility or honor, or shall, without the consent of congress, accept or retain any present, pension, office, or emolument of any kind whatever, from any emperor, king, prince, or foreign power, such person shall cease to be a citizen of the United States, and shall be incapable of holding any office of trust or profit under them, or either of them. I'm sure you're wondering, "What in the world?" or " Where do you get that?" Well, I am going to show you exactly where I get that. And in the process, if you really care about what's going on in America and desire to help preserve our liberties, follow this complete article with all of the links and documents provided. The Constitution was ratified in 1789. However, during the ratification process, there was a huge outcry that there were no guarantees in the Constitution that the national government would respect the rights of the People, and that the newly proposed form of government could easily become just as tyrannical as King George and the British Parliament had become. So, with opposition mounting and realizing that the Constitution, good as it was, might not be passed (amendments cannot be added during the ratification process), a bill (declaration) of rights was drawn up, and the promise was made that, as soon as the Constitution was ratified, amendments would be added to guarantee the rights of the People. This assurance made the Constitution acceptable in the eyes of most of those who were concerned (those were the days - when you could trust the promise of a "politician") and the Constitution was ratified in 1787. 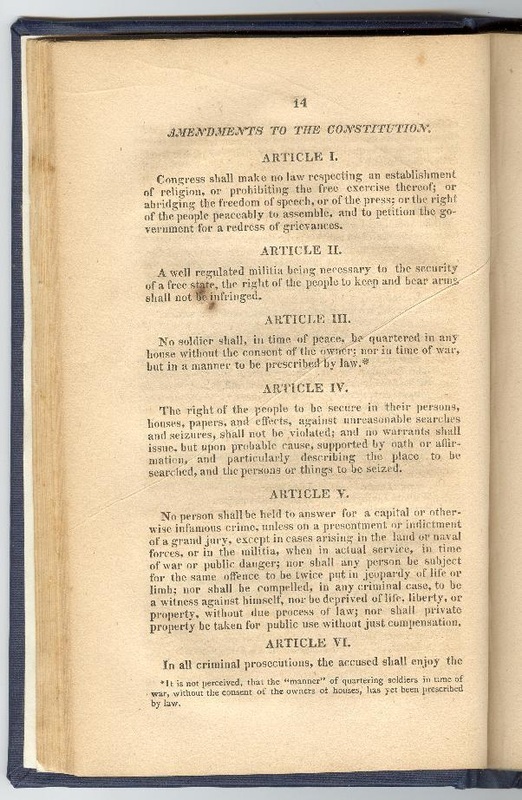 As promised, the first ten amendments were passed by the first Congress in 1791 and are known as the Bill of Rights. Four years later, in 1795, the 11th Amendment was ratified, and nine years after that in 1804, the 12th Amendment was ratified. Now, the 13th Amendment that is currently listed in all the constitutions printed today was ratified on December 6, 1865, after the Civil War had ended, during what is called the Reconstruction Period. With those dates fixed in your mind, I present to you the following pictures. 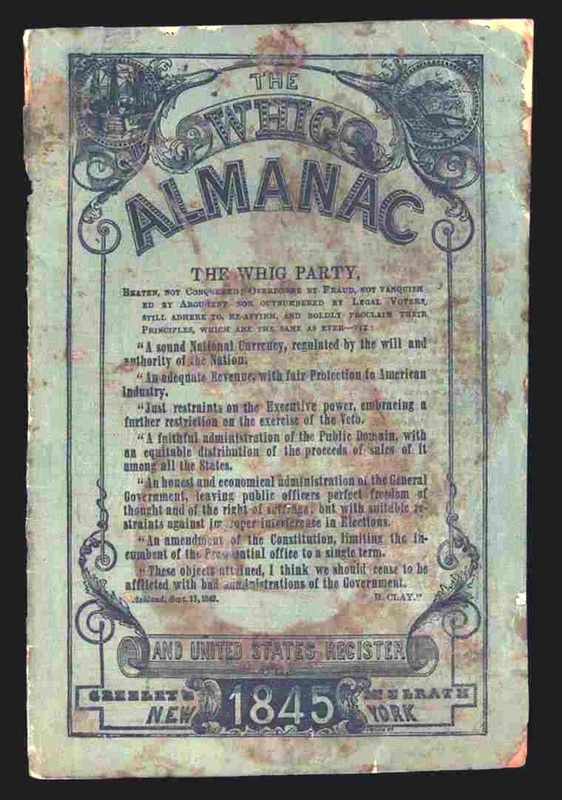 The picture on the left is of the outside of a booklet printed by the Whig Party which contains various information promoting the agenda of the Whig Party. Included in the booklet is the Constitution of the United States and the amendments that had been passed by Congress up to that time. Notice the date on the bottom of the front cover - 1845. The picture on the right is of page 25 of the same booklet. At the bottom of the right column is the 13th Amendment. Notice that it says the same thing as given above: "If any citizen of the United States shall accept... any title of nobility or honor... such person shall cease to be a citizen of the United States, and shall be incapable of holding any office..."
That is the original 13th Amendment. 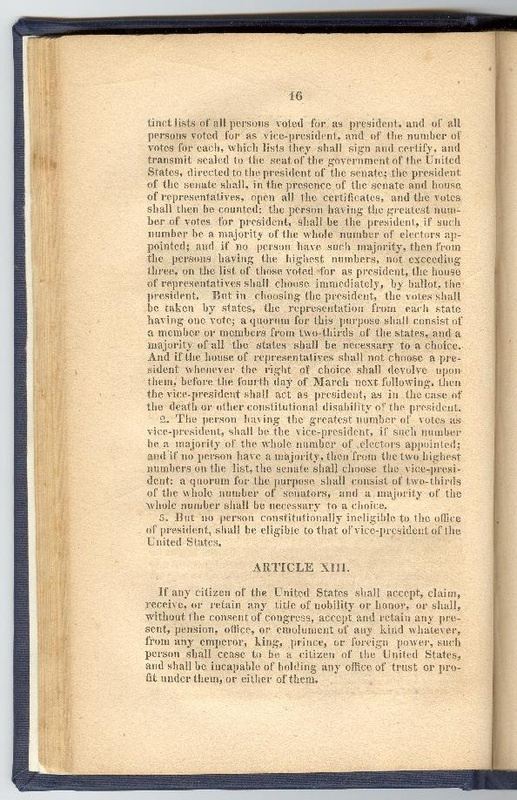 Now notice the note below the 13th Amendment which states when the amendment was proposed to Congress - during the second session of the eleventh Congress. Congressmen have two year terms, so the eleventh Congress would be 22 years after 1789 when the Constitution was ratified and the first Congress was elected. So, 1789 plus 22 years plus one year (for the second session) comes out to 1812. So one could know that, since it was printed in this booklet in 1845, the amendment was ratified sometime between 1812 and 1845. 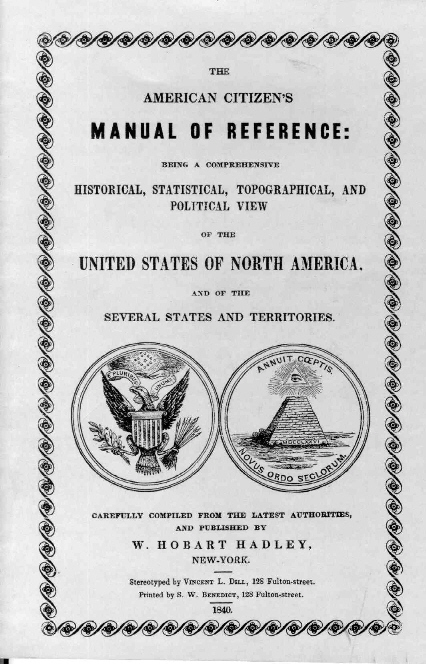 The American Citizen's Manual of Reference, printed in 1840. 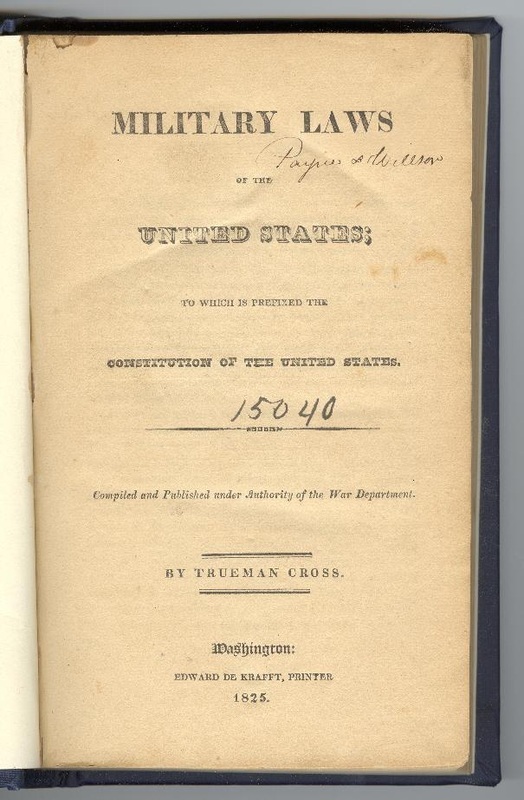 We provide you with the front cover and a page showing you the amendments to the Constitution, specifically, the 13th amendment as was recognized at that time by all authorities. Published by W. Hobart Hadley in New York, it states clearly that it was "carefully compiled from the latest authorities". As you can see, the last amendment is Art. XIII, the original 13th Amendment. It says nothing about slavery because the slavery amendment was actually the 14th Amendment and would not be enacted until 1865, still 25 years into the future. 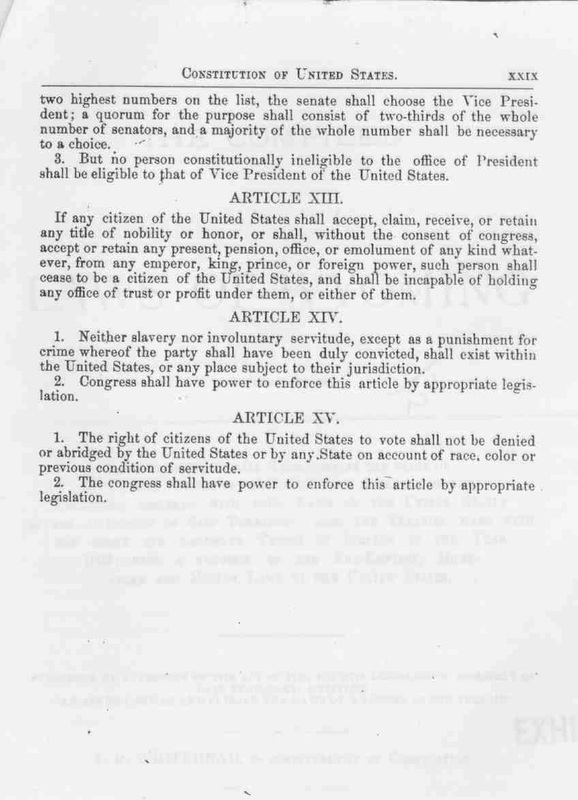 This printing matches the wording in the 13th Amendment as printed in the Whig Party publication, banning citizens from accepting or retaining titles of nobility or honor. You see, in the years immediately following the War for Independence, Americans were devoted to making a clear distinction and separation from the power of Britain and taking their place on the world stage as a nation that needs not bow to any other - a sovereign nation. Not wanting people as citizens or in public office who were subject to the king was very important to maintaining that separation and sovereignty. In fact, the reason for this amendment was because Great Britain had shown itself to be a poor loser, and was secretly trying to undermine the sovereignty of both the united States and what was now being called the United States, where the adjective "united" was part of the name used to designate the nation composed of the several sovereign States. Notice also that in the picture on the right, the genuineness of the photo is seen in the fact that you can see the print from the previous page showing through due to the strength of the light used to scan the book. You can even make out some of the words if you can read backwards. This is proof that this is not a photo-shopped image or a creation of a fake document to bolster some crazy conspiracy theory. This is real. 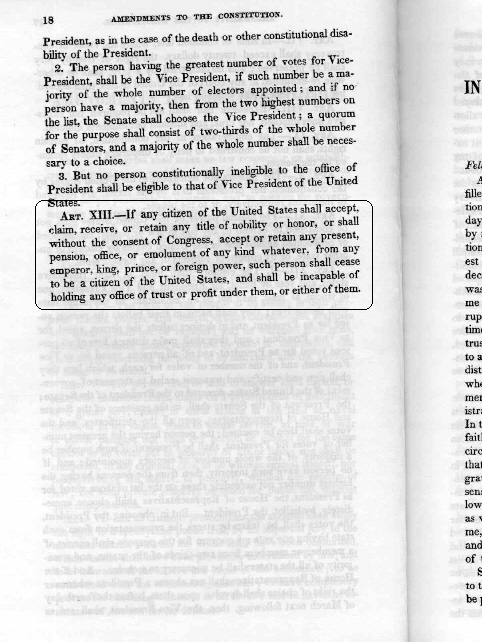 There really was a 13th Amendment passed by Congress, and as you know, amendments must be repealed, or they still stand as law with the rest of the Constitution (see Article V of the U.S. Constitution). So why is it not being printed in current editions of the Constitution? If that's what you're wondering, you have the makings of a real patriot! We'll answer that question in a while, but first, more proof that will reveal even more insidiously evil attempts to bring the United States and all the People under the authority of foreign powers. 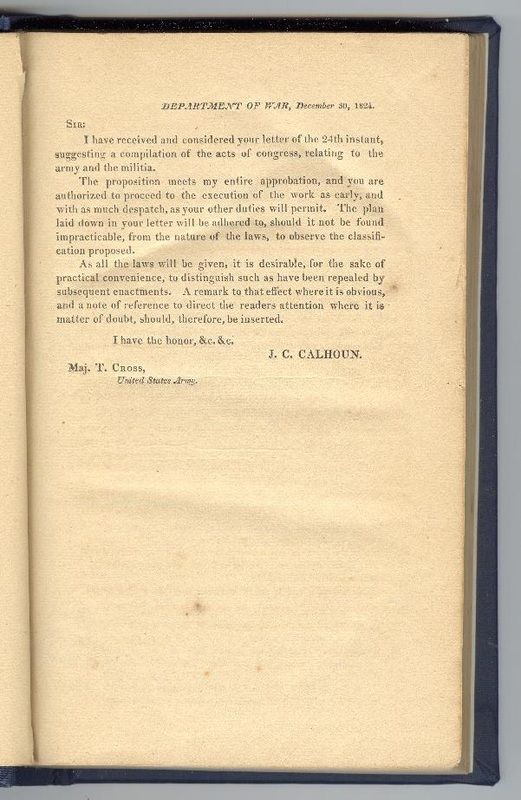 In 1825, Major Trueman Cross requested the approval of John C. Calhoun, Secretary of War under President James Monroe, to write a manual for the army that would include the Constitution and all the acts of Congress related to the army (since they take an oath to defend it). It was specifically stated that, "The propriety of rendering all the penal laws accessible to those on whom they are to operate, is sufficiently obvious -- and... that the laws relating to organization and administration, though repealed or modified, should, also, be placed within the reach of the army." 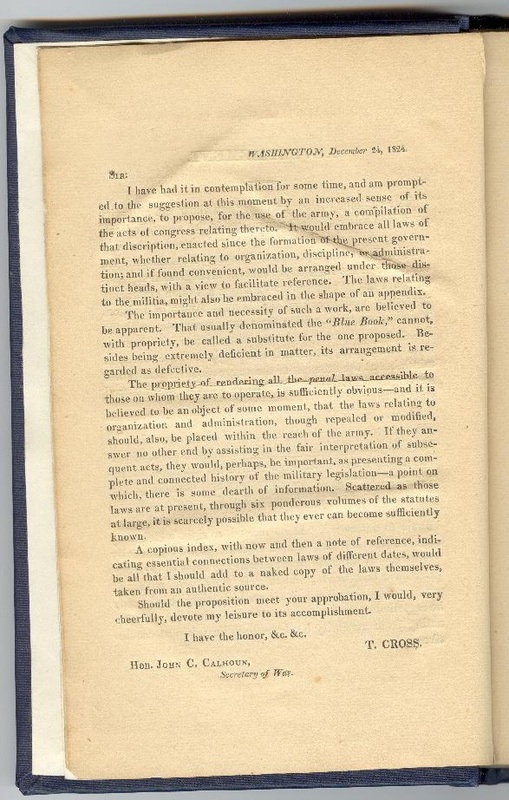 Below are images of the cover of the manual, called, "Military Laws of the United States", the page showing the letter from Major Cross to the Secretary Calhoun, and the response from Secretary Calhoun to Major Cross, giving his approval for the writing of the manual and specifically expressing, "As all the laws will be given, it is desirable... to distinguish such as have been repealed by subsequent enactments." 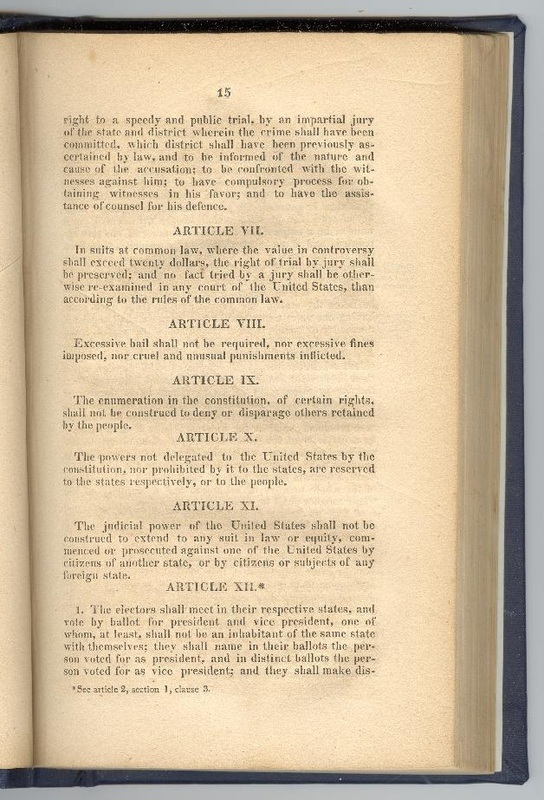 Also below are images of the pages showing the Amendments to the Constitution, specifically, the 13th Amendment which was the last one ratified prior to the Civil War. Notice that there are no marginal notes showing that it was ever repealed. We can also know from this manual that the amendment had to have been passed between 1812 and 1825. This ought to wake up a lot of people to the fact that there is an amendment to the Constitution that is being hidden from the American people! This ought to make us angry and cause millions of people to demand answers. The problem is, millions do not know about this. Help spread the word. Send a link to this page to your friends. By the way, as a side note, notice on the page showing the second amendment that there is only one comma in the 2nd Amendment. When you look at the one in modern day publications, you will find three commas! One comma creates two parts, three commas creates four parts. If you know anything about the abilities of lawyers to twist words and meanings of laws, you will understand that a sentence with three commas is easier to break up and twist the meanings than a sentence with only one comma. But wait, it gets worse! Now I will show you the diabolical lengths to which those trying to control us all and steal our liberties have gone to hide the original 13th Amendment, which had limited the power of Britain to undermine our country from the inside. For proof of when it was actually ratified (March 12, 1819) you can do your own research at www.amendment-13.org, plus see some of these same images (this is where I got them). 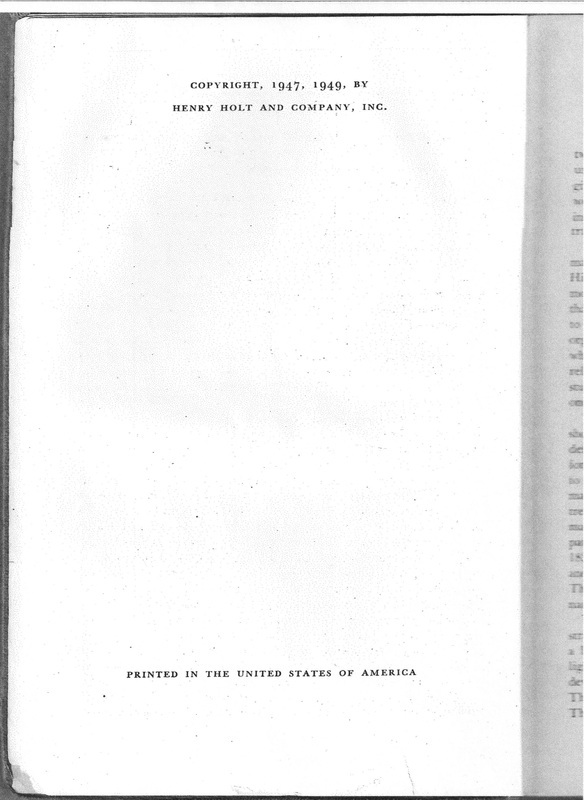 Below are images of a publication, printed in 1876, for the people of the territory of Wyoming, 57 years after it was ratified and six years after the Voting Rights amendment was ratified in 1870. Note the order in which the 13th, 14th and 15th amendments are listed (they are always listed in the order in which they were ratified). Here you see the 14th Amendment was the one dealing with slavery and involuntary servitude. Yet, in modern publications it is listed as the 13th. Notice also that the 15th Amendment deals with the right to vote. There is no amendment shown as being passed or ratified between the original 14th and the original 15th. Now, the original 14th Amendment (13th in modern publications), banning slavery, was ratified on December 6, 1865, and the original 15th Amendment (same number in modern publications), dealing with the right to vote was ratified on February 3, 1870. This begs the question, "How did the 14th Amendment (as printed in modern publications) get into the Constitution when it is listed as being ratified on July 9, 1868?" 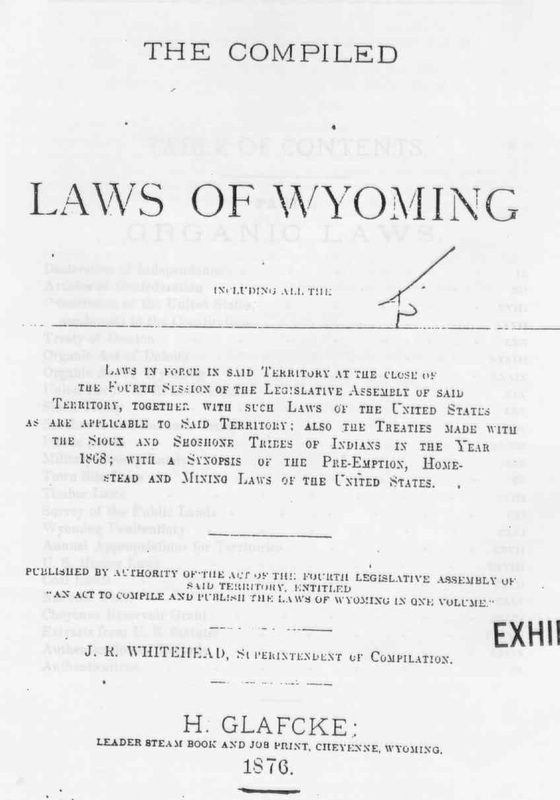 And if it was ratified, why is it not listed in order in the compilation of the laws of Wyoming? In fact, it is completely missing while an amendment ratified two years later is present! 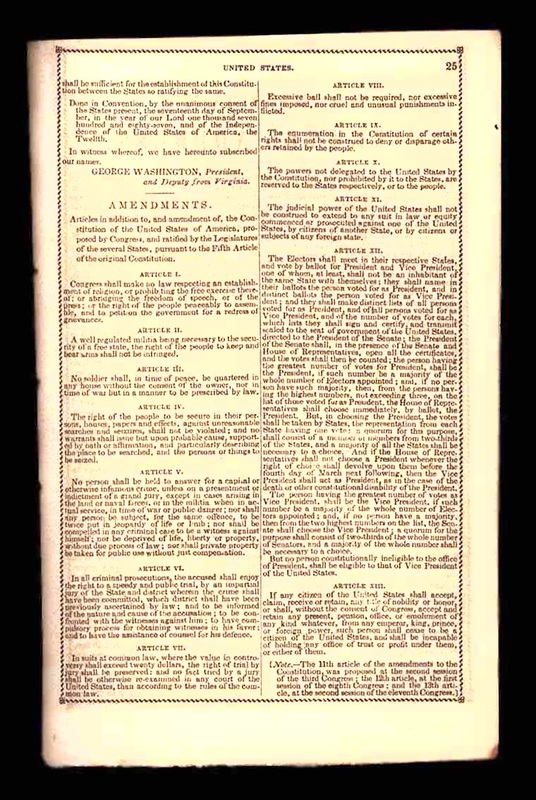 It is clear that the original 13th Amendment was eliminated by agents putting pressure on printers between the years of 1860 and 1890 for the purposes of purging from the record, as much as possible, the truth of the original 13th Amendment and the impact it had and would have on the ability of people with loyalty to Britain via the London Bar Association from getting involved in the political process in America to aid in bringing Americans back under the control of the Crown. Recently someone to whom I had presented this information to several montha ago, showed me a history book that reveals the fraud and obvious attempt to hide the truth. 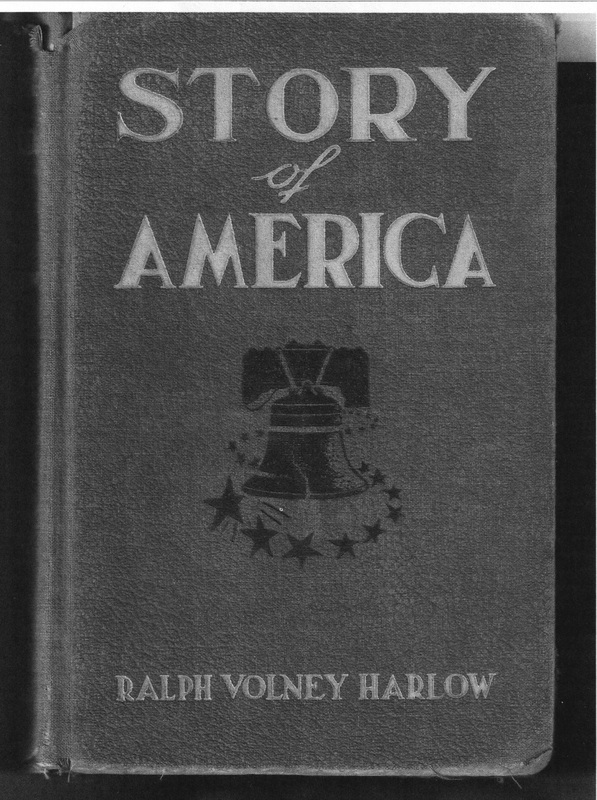 It is a history book published in 1947 called, "Story of America", by Ralph Volney Harlow. 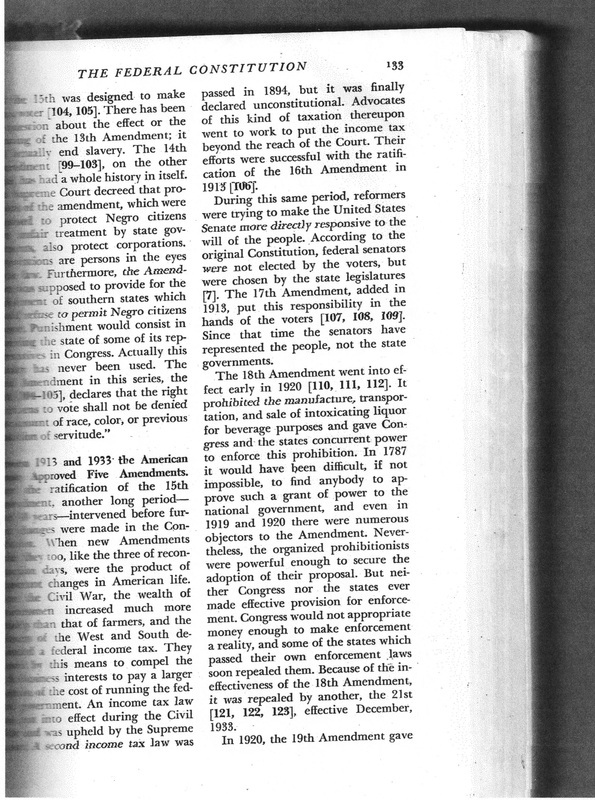 In this book there is a section that deals with amendments that were passed between 1791 and 1865. It clearly says that there were three; yet only two are mentioned, the 11th and the 12th! The 13th Amendment is not even mentioned! Why? Well, it appears that publishers have a say in what gets published by them or not. If you want to get published by a "reputable" publisher and make money, you have to bow to the demands of the publishers. It appears that the author bowed, but left us a clue. Below are images from the book which I scanned this past thanksgiving day (2013). The first ten amendments were all ratified in 1791. Notice the paragraph beginning at the bottom of the left column in the photo on the left. You can read the whole section entitled, "Between 1791 abd 1865 ﻿There﻿ Were Only Three Amendments", and see that no mention of the 13th Amendment is made (though the 11th and 12th were mentioned). Then the next section, entitled, "The Civil War Made Three Amendments Necessary". This puts a whole new meaning to the era called "Reconstruction"! What are you going to do with this information? Are you a true patriot or are you content to be a passive, willing slave? Find a way to spread this information to patriot groups in your area. Spread the word! In all fairness, and out of respect for a friend of liberty, Larry Becraft, who happens to disagree with this article, I present you with a link to his article where he debunks what he calls the "Missing 13th Amendment". 1) Esquire is not a title of nobility, therefore, they are not under the "Crown". On this he is right; however, I do not propose that Esquire is a title of nobility, but it definitely is a title of honour, if bestowed by the Queen. As I explained earlier in this article, many of our founding fathers used the title Esquire as a way of letting people know they were capable of representing and counseling them in matters of law and as a sign of the respectable nature of their capabiblities as lawyers. It was a sign of respect. The original 13th amendment prohibited titles of honor as well, meaning titles of honor bestowed by the Queen (the Crown), but it was never intended to prohibit people from showing respect to another. 2) Lack of proof of ratification. To that I make two points. First, his proof is based on whether newly admitted states ratified the amendment or not. This is a debatable point and is not settled law. To my knowledge there has never been a ruling on whether or not newly admitted states must be counted in the ratification process; therefore, I conclude it does not disprove what I believe is a fact because of all the overwhelming evidence that shows that states acted as though it had been ratified. I personally believe that common sense prevailed and that states that were only territories when this amendment was being debated, of their own free will did not participate in the ratification of an amendment that had been debated in the legislatures of the states in the Union at the time it was proposed, and that the states who did ratify understood their silence. Second, it is quite possible for actual physical evidence to be destroyed, yet that does not negate whether something actually happened. No more than someone destroying evidence of a murder negates the fact that a murder took place. It's just harder to prove in court. My respect for Larry in other matters and issues he has studied is why I count him a friend of liberty even though he disagrees with this article. I extend to him the courtesy of allowing him to disagree and remain an esteemed friend of liberty and of the Constitution. 3) Patriot "gurus" who are wrong on other issues or in their reasons for believing in the original 13th amendment. Just because someone is wrong in one area does not mean they will be wrong in another. Even mentally challenged people can get some things right! So I don't throw out the baby with the bath water, nor do I reject an argument merely because the one making it is wrong in some other area. I know people who make false claims in defending the accuracy of the Bible, but that does not cause me to doubt it. I read Larry's article posted above and it did not change my mind. I wrote him and pointed out to him that he did not address the "or honor" issue. Nor does he deal with the historical perspective and the obvious attempts by the British to somehow bring America back under its control. I have not heard back from him regarding that specific point. From his response, I doubted whether he had actually read this whole article, but possibly merely saw what it was about and sent me the link to his article with a statement that many gurus have been promoting this idea. At the least, I hope I can be an example of how we should not fight over issues that cannot be proved conclusively.